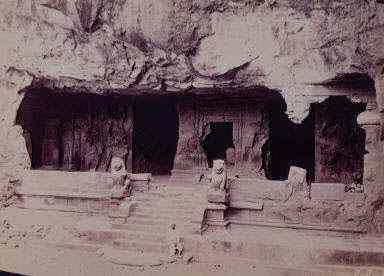 The caves of Elephanta are located in District Kolaba (Island of Elephanta.) The 'City of Caves', on an island in the Sea of Oman close to Bombay contains a collection of rock art linked to the cult of Shiva. These caves are thought to date back to the Silhara kings of the 9th through 12th centuries A.D.. They are spread over an area of 500 sq mt, these are a complex of temples. The cave complex is a collection of shrines, courtyards, inner cells, grand halls and porticos arranged in the splendid symmetry of Indian rock-cut architecture, and filled with exquisite stone sculptures of Hindu Gods and Goddesses.